I have a really strong feeling that if Parkerhouse snausages are not already a board favorite, if the word spreads, they soon will be. I'm really not a big sausage fan, but I lu-u-u-uv them too. Do you know if they make a mild? I (perhaps incorrectly) only thought they made "hot," so GWiv's picture, in which he was not sure if there was a "hot,' the product he snapped was, in fact, "hot." I tried serving their souse at the restaurant one time, but no one would order it. It ain't bad, but I'm no kindasewer. If you ever see pig's brains in glass jars like my grampa used to scramble w/ eggs, lemme know. gonefishin wrote: I've actually been looking for someplace to order a sassafras tree from, that way I can grind up my own Filé powder for gumbo. Readily available. This nursery actually has some decent sized ones. Never ordered from here but have bought trees and shrubs many times mail order with great success. There won't be any mojo criollo chicken in my gumbo, since my pesky family ate all the chicken last night. 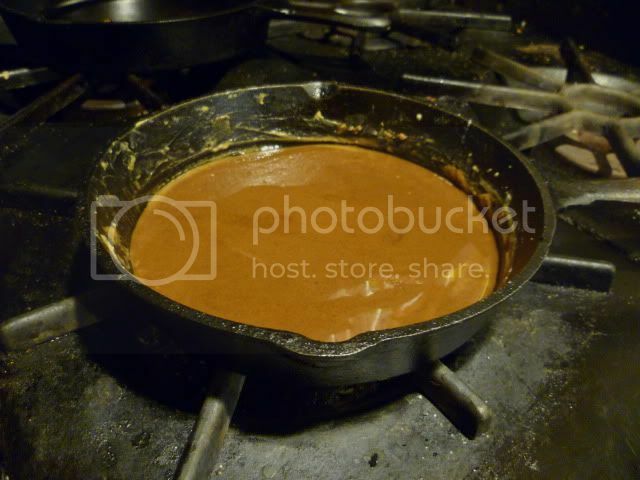 I am another one who doesn't mind stirring a roux, and I recognize that most of the preparation of a gumbo is done in a frying pan or dutch oven on the stove. I'm thinking, when all the components are browned and sauteed and put together, I could put it in the crockpot to simmer and hold it that way. Katie-while not traditional, I always add my roux at the end of the recipe and then simmer for another 30 minutes or so. So theoretically you could start the gumbo in the crockpot, come home, make the roux, then add the crockpot contents to the pot you're cooking the roux in, then add okra or seafood if desired. You'll hafta skim the sausage fat from the broth , but you can add it back when making the roux, that way you won't lose any of the flavor. Otherwise, I'm thinking that the starch bonds won't hold at a cooking temperature for eight hours, and your roux will eventually lose its ability to thicken. I guess I've hit on a personal specialty. The latest batch of okra gumbo with smoked sausage and grilled chicken was a big hit. Despite the high veg-to-meat ratio, Sweet Baboo had three bowls and said I could make money selling it. I gave away containers of extra gumbo to two neighbors and now two other neighbors are disappointed that they missed out and want to know when I'm going to make some more. When do you all put your veg in? If add it more than 30 min before I expect the gumbo to be done it all seems to just dissapear. zoid wrote: When do you all put your veg in? 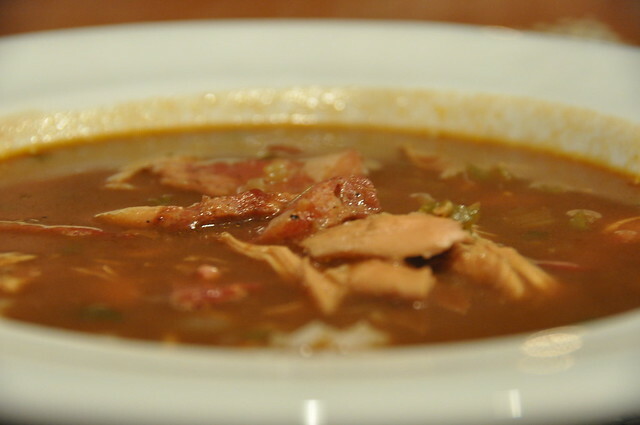 The vegetables in a gumbo don't carry the same as in a chicken (or other) soup. I develop my roux, then add all the vegetables until wilted, then add andouille cooking for a bit, add shellfish stock and so on. I did a large batch of gumbo last Sunday. This was a pretty simple and straightforward version, cooked with what we had on hand -- peppers, onion, celery, andouille from Port Allen, LA, a smoke-roasted whole chicken (pulled and then bones and extras used to created a quick broth while the roux was browning). Technique is as others describe above -- roux on the stove, using just over a cup of flour with the same amount of fat (combination of vegetable oil and bacon fat). 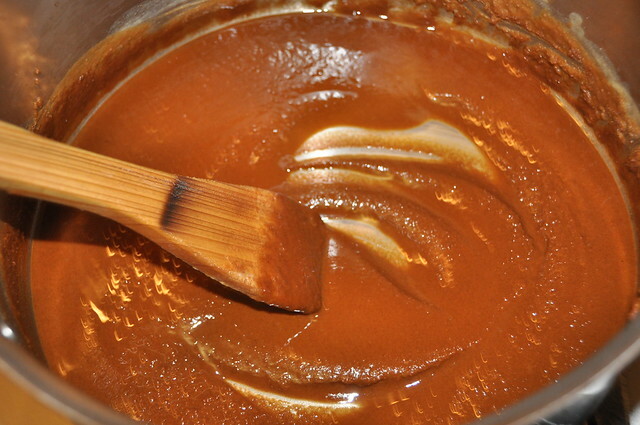 Here's a shot of the roux a few shades shy of where it ended up. I add the vegetables (together with the spices) right after the roux hits a dark chocolate brown, let them cook/wilt down, then chicken stock and let that simmer for a while, skimming oil periodically (lots of oil to give up, although I am not religious about cooking it until there is no more oil to skim). Pulled/shredded chicken and andouille added after the roux-broth-vegetable base has simmered for maybe an hour or so. Let that simmer for an hour or so, then good to go. As I cooked this post-dinner last Sunday, I did a quick cool in a sink full of ice and water, then into the fridge to eat the next day; in my experience, gumbo is often better if it has had a chance to sit and let the flavors develop. 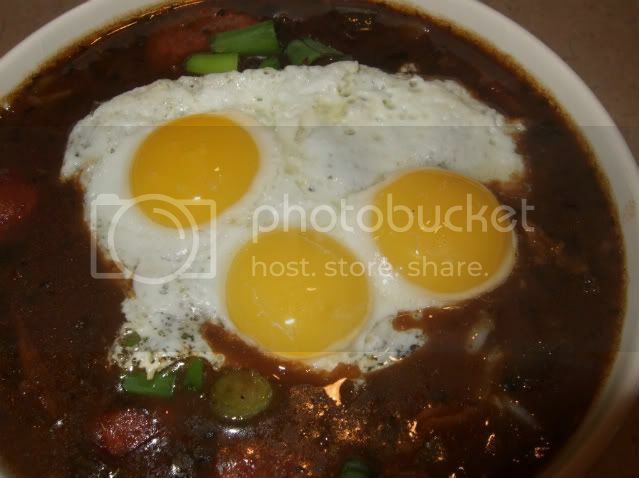 Excellent looking bowl of gumbo. Nice developed roux and wonderful looking andouille...I'm drooling! You guys take some real nice pictures of your food too, kudos. Last edited by gonefishin on September 18th, 2010, 10:16 am, edited 1 time in total. Beautiful gumbo Matt - looks great. Lovely Matt! 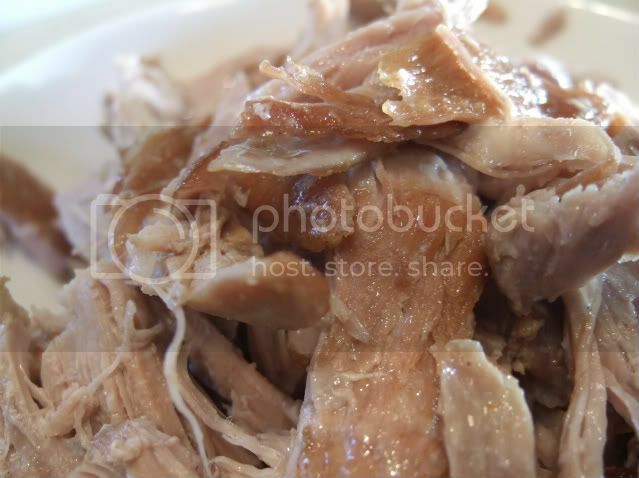 Did you smoke-roast the chicken yourself, or do you have a source for picking them up? Thanks, Dan, BR, and annak. 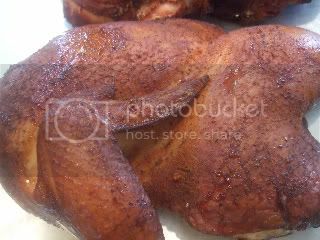 annak -- I smoke-roasted the chicken myself (I have a Big Green Egg grill/cooker). I know there are a number of sources for smoked chickens around town, though, if you do not have the means to do it yourself -- pretty sure you can get smoked whole chickens at the larger Whole Foods stores (Kingsbury, Peterson, and Roosevelt), for example, and I am sure there are smaller, independent meat markets and groceries where you could get the same. Matt, that looks absolutely great! I prefer a darker roux and you hit it on the spot. 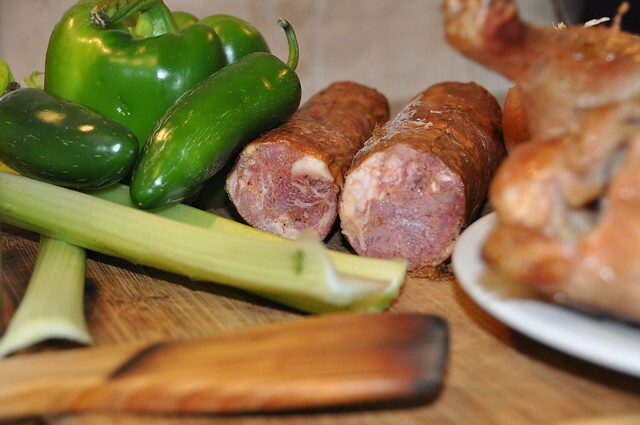 The andouille you used also looks "authentic Cajun". 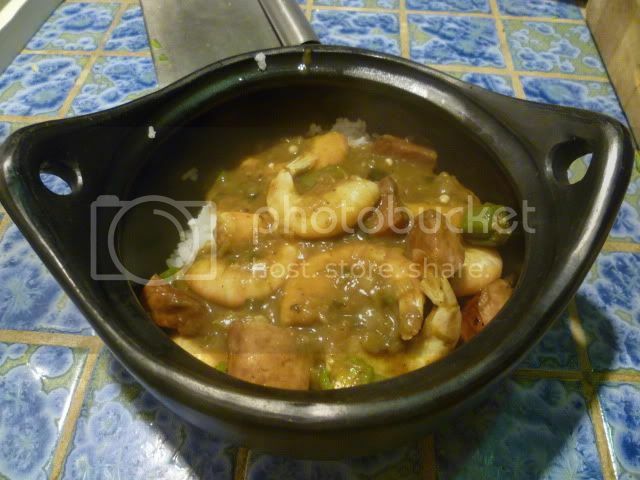 It's still way hot here in GA, but when the weather breaks I'll be getting the gumbo pot out. 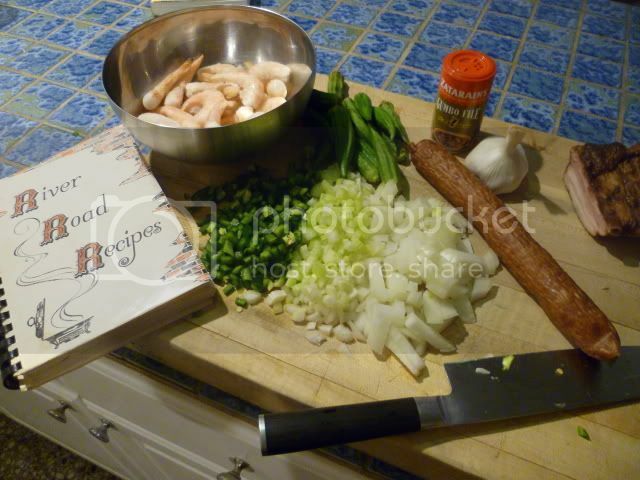 I haven't tried my hand at gumbo yet but this thread is making me want to change that. I have tried the andouille that the folks at Wurst Kitchen in Aurora make on its own and it seem pretty tasty so will probably use that for my inaugural batch. 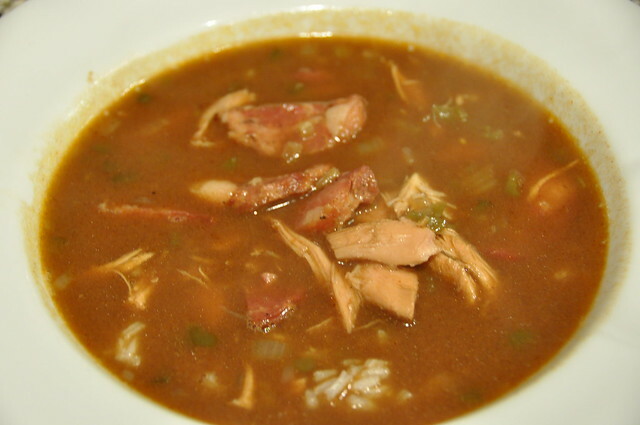 really nice job on that gumbo, using your own smoked/roasted meat is a great adder to the overall flavor of the gumbo for sure, and a great way to use up extra smoked chicken and pork. 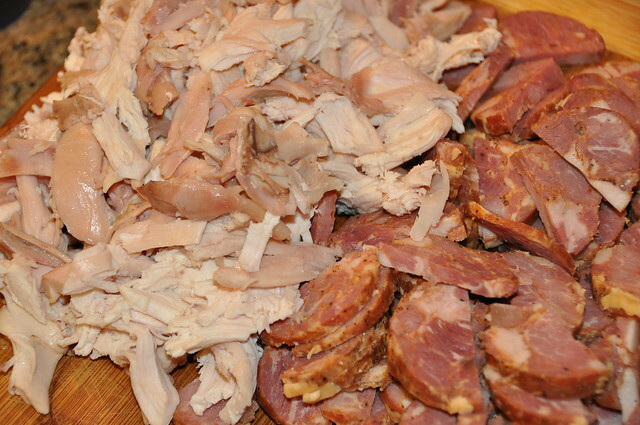 I have to get up to the Ho-Ka turkey farm soon to get the protein for a batch of turkey gumbo. 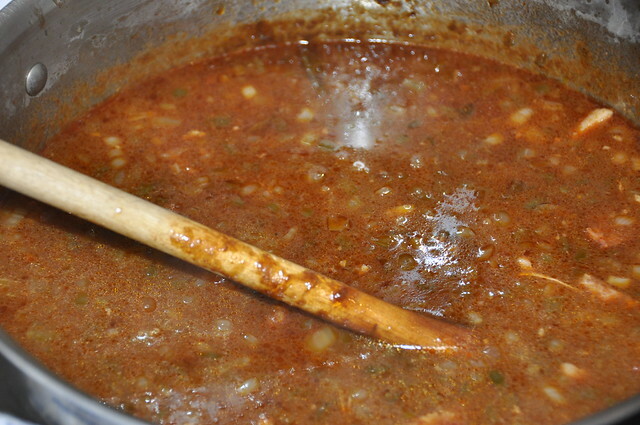 fixin' to do up a batch of gumbo on Sunday for the football games. Most likely chicken and sausage, but if my visit this afternoon to Czimers provides me with some duck(or rabbit) I might go that route. I am hoping Czimers has some of the alligator and or crawfish boudin they had last time I was there. id eat a bowl or two of that, nicely done. Great sausage including andouille made on site at Zier Prime Meats in Wilmette. Looks great! I feel a trip to Breaux Bridge coming on. I haven't been to Mulate's in a few years. A really nice version tonight, one of my best. I really cut down on the veg. in the trinity, and switched out the green pepper for some diced jalapeno. 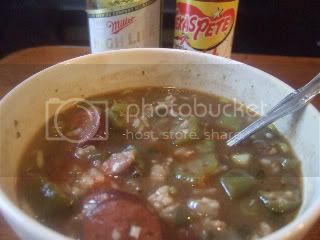 I love the gumbo's broth, and dont like version choked full of veg. Roux was done with lard, works alot better than other fats imho. 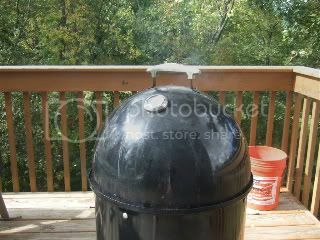 Also fired up the WSM to smoke up the chicken & polish using applewood. Basic method was a 15 minute high heat to start roux, trinity added, then worked in the chix stock. 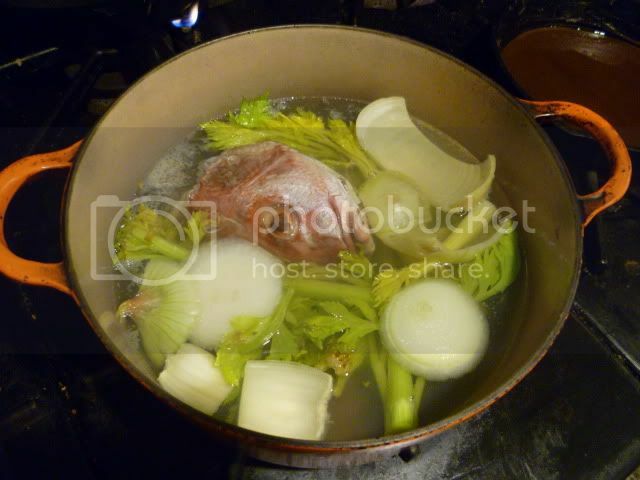 A bit of simmerieng and boiling to thicken the broth. Added the sausage and other items, took the fat off the top as well. Reserved smoked chicken was added late, and the okra only had 5 minutes in the simmering mix. End result was a deep flavored, smokey bowl. Great broth, tender veg. I topped my bowl with some extra green onion, and some gumbo file. cant wait for tomorrow for another bowl. Last edited by jimswside on September 27th, 2010, 7:26 am, edited 2 times in total. I have fresh okra if you need it and I think more still coming...just let me know. boudreaulicious wrote: I have fresh okra if you need it and I think more still coming...just let me know. thanks to the assistance of Rick T, I'll be ordering a Sassafras tree for this falls planting. I've heard that file powder is best used fresh. Since I've had a hard time finding someone down south to send me some leaves I'll have to plant my own. Maybe after a year or so, once the tree produces a decent amount of leaves, we can have a gumbo ingredient swap. I can swap some sassafras leaves for some okra lol. This was my first year planting okra (thanks Pairs For Life!!) and I'm so glad I did. Beautiful plant, prolific, bug and critter-resistant--a wonderful addition to the garden. I will definitely do it again next year. Happy to trade or just send some your way! I could have used some this time, I ended up using frozen(which I have done before with good results). THe fresh okra @ Ultra Foods didnt look good this time, and it was around $5/lb. A frozen bag already sliced was about $1.72/lb. Last edited by jimswside on December 3rd, 2010, 4:15 pm, edited 1 time in total. Hi- I am not sure how much they charge, but you can buy okra at the Evanston Farmer's Market. I know for sure Henry has it, and for a lot less than $5 a pound. Nichol's might have it too. I receive Henry's newsletter that his sister composes and sends out by email every week. I usually receive it on Thursday evening, and she tells everybody what Henry and his other sister Teresa are bringing to the Evanston market that Saturday. I know they said that Henry was bringing okra this last Saturday. He might very well have some this Saturday too. Tried a new gumbo recipe Sunday, and was pretty happy with the results. Ill call it pork spare rib and tips gumbo. Variations on the recipe were to use a slab of spare ribs and the rib tips. I seared these in a pot with hot oil, then simmered the seared ribs and tips for 2 hours in 3 quarts of chicken stock and a couple cloves of garlic. End result was 2 quarts of a chicken stock infused with porky goodness. 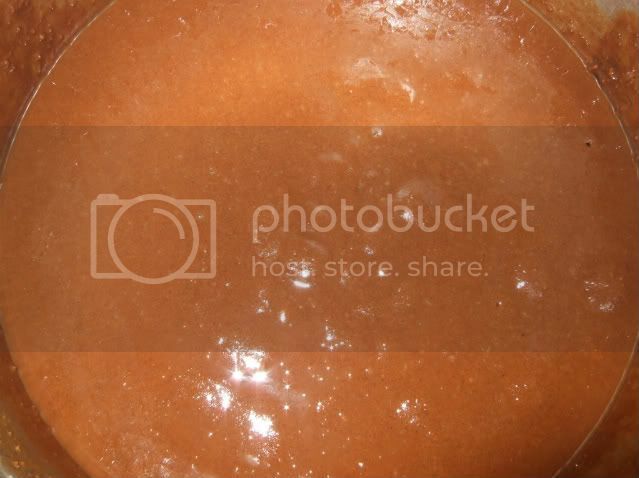 I strained the stock and kept it on the stovetop, and got as much grease out of it as possible. Pork was pulled off the bone and reserved, it resembled the brilliant crispy pata I had recently @ Sunda actually. Veg was celery, green pepper, onion, green onion and jalapenos. Kilbasa was the sausage choice. The roux(flour and butter)...., an hour version(or 2 beer, 2 bourbon shots, and 2 tequila shots) that was incredible. Dark mahogony color, and nice. edit: second night this gumbo was brilliant, the dark roux really had it popping with layers of deep flavor. Broth was silky and thicker than the 1st night. Next batch Ill add some okra & perhaps some crispy pork belly. Well my Cajun buddy loved it. I loved parts of it- those shrimp are a really nice product and you can't go wrong with smoked meats. 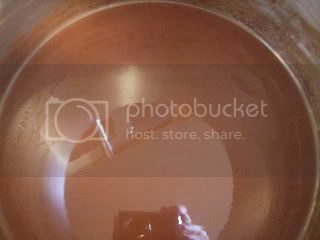 The roux added a nice roasted nuttiness and I really dug the herbal finish provided by the file. I love okra, but I guess I haven't cooked a whole lot of it. I rinsed the coined okra in cold water several times, blanched it, rinsed again, and added to the gumbo for about 10 minutes of cooking, maintaining quite a bit of its green. It did its okra thing to the texture of the stew though, which I wasn't 100% down with. 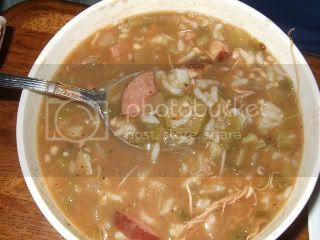 My buddy remarked that many a cup of gumbo down south, the kind laden with the veggie, often has this viscous texture. I feel like I've had less snotty bowls of the stuff with okra at restaurants though. Any tips out there or is okra ooze just a fact of life? 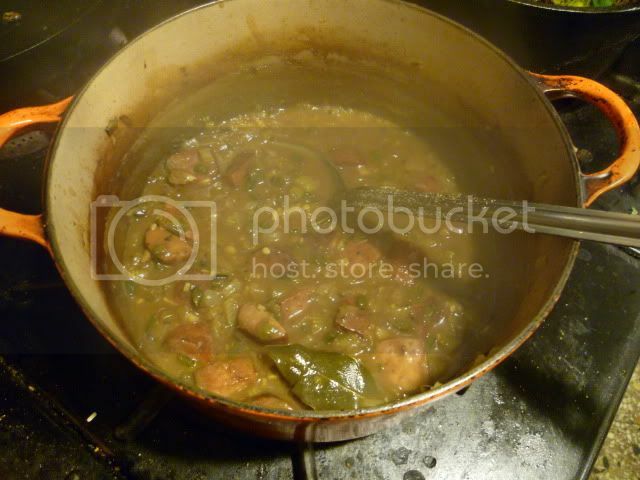 Donald Link's Real Cajun suggests that before adding the okra, which he does 15 minutes before the gumbo is finished cooking, that you saute it for 8 minutes until lightly browned. This cooks away all the slime. 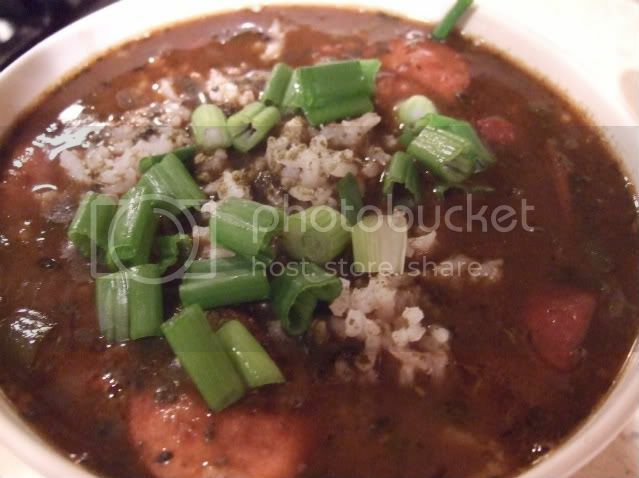 I also often make the gumbo without any okra and don't feel it is a huge loss.